3-DFT12 Size: 12" Features: -You can now take the guesswork out of outdoor grilling and concentrate more on the beauty of the great outdoors. 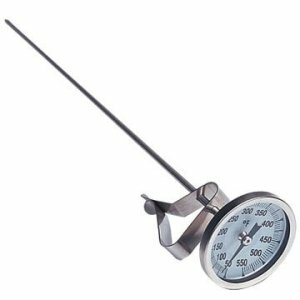 -Allow yourself to effortlessly monitor and regulate the temperature of your grill with the Camp Chef Thermometer. Product Type: -Thermometer. Finish: -Silver. Tool Head Material: -Other. Number of Items Included: -1. Dimensions: Overall Product Weight: -1 Pounds. Size 6" - Overall Height - Top to Bottom: -6 Inches. Size 6" - Overall Width - Side to Side: -2 Inches. Size 6" - Overall Depth - Front to Back: -2 Inches. Size 12" - Overall Height - Top to Bottom: -12 Inches. Size 12" - Overall Width - Side to Side: -2 Inches. Size 12" - Overall Depth - Front to Back: -2 Inches.